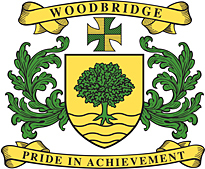 Woodbridge High School is a thriving, ethnically diverse, successful 11-18 comprehensive school that serves its local community in the heart of Woodford. The school is becoming a ten form entry school with the first cohort of 300 year 7 students starting in September 2014. The sixth form of 370 students continues to prosper with the majority of our students staying on. The teaching staff are all specialists in their separate areas and permanently contracted to the school. Year on year the school attracts a high number of first choice applications, with a record number of first choice places allocated this year. The school has a diverse curriculum that meets the needs of all the students and provides them with a pathway towards their chosen careers. The school is a happy, flourishing and mutually respectful place of learning. Woodbridge has a reputation as a leading Language, Business and Enterprise College with nationally recognised events held at the school. Our Applied Learning Specialism indicates the school's commitment to a range of student courses. A commitment to high standards and to the success of every student is reinforced by the school's motto: ‘Pride in Achievement’. Students at Woodbridge benefit from first class facilities including an artificial grass pitch, outdoor basketball nets and table-tennis tables, refurbished sports hall, state of the art sound and lighting system in the hall and remodelled library. The proposed development work will bring about further enhancements to the site.